Halloween is one of my very favorite holidays! Why? Well, first of all, it’s a chance to be something you’re not. What kid (of all ages) doesn’t like to play pretend? I try to squeeze in some Halloween fun wherever I can! 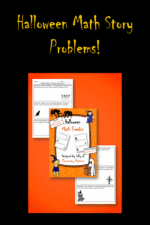 Click the image for this Math Story Problems Freebie! 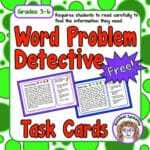 Word Problem Detectives – Get Your Students to Read Carefully!